Plans to put a statue of Nelson Mandela on Trafalgar Square's new north terrace have been rejected by councillors. Westminster City Council said the 9ft tribute to the former South African president was not in keeping with the "open nature" of the terrace. But mayor Ken Livingstone said he would appeal to the deputy prime minister to overturn the decision. Mr Livingstone has campaigned for the statue along with the sponsors - film director Lord Attenborough and Wendy Woods, widow of anti-apartheid campaigner Donald Woods. After the meeting on Thursday evening, Mr Livingstone said the decision showed the committee was out of touch with public opinion. "I will now work hard with sculptor Ian Walters, and the project sponsors... to try to get the statue in place by appealing John Prescott," he said. "We will be lodging our appeal immediately." A year ago Westminster's public art advisory committee said the £195,000 statue was too big and in too prominent a location. Planning officers had recommended councillors reject the application. Committee chairman Councillor Angela Hooper, said: "We have decided on planning grounds that we are not happy with this application. "Our concern is to preserve the open nature of the north terrace as well as providing a fitting tribute to Mr Mandela." 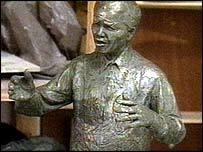 Councillors said they were enthusiastic about the principle of a statue to Mr Mandela in Trafalgar Square, but preferred a site outside South Africa House. But Mrs Woods, has said it was her husband's vision the statue be built on the north terrace. She said: "The qualities that Nelson Mandela has have been recognised throughout the world. "This statue would be a representation of the world's recognition of those qualities."